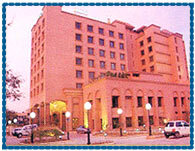 Hotel Holiday Inn Agra, Holiday Inn Hotel Agra, Reservation for Hotel Holiday Inn, Agra, India. Address: 16/2/8, Sanjay Place, M.G. Road, Agra, Uttar Pradesh -282 001, India. Accessibility: 10 kms.from Airport, 8 kms. from Railway Station, 5 kms. from Bus Stand. Hotel Holiday Inn is located in one of the posh localities, the MG Road, in the heart of Agra city. It is a Government approved 4 star hotel offering warm and caring personalised services, to cater the needs of the tourists coming to Agra to have a fantastic rendezvous with the Taj Mahal. Hotel offers 148 tastefully furnished rooms and suites, having in-room facilities like individual climate control, telephone with voice mail, international direct dialing, round the clock room service, hair dryers, mini bars, 24-hour satellite entertainment, 4 channel music and carefully selected personal care products which are standard in every room to provide the very best of relaxation. Indoor Pool, Holidome, Pets Allowed, Outdoor Pool, High-speed Internet Access, Sauna, Whirlpool, Kids Eat Free, Airport Shuttle, Kitchenette, 24 Hour Front Desk, 24 Hour Room Service, A/C Public Areas, Baby-Sitting, Beauty Salon, Concierge Services, Dry Cleaning/Laundry, Florist, Foreign Currency Exchange, Gift Shop, Ice Machine, Newsstand, On-site Guest Laundry Facilities, Public Transportation, Safety Deposit Box, Secretarial Services, Shoe Shine, Shopping Arcade, Turndown Service, Wake Up Calls, Copying Service, Courier Service, Facsimile Service, Business Center, PC Service, Printer Service, Private Limousine Service, Translation Service.